Conventional water treatment concepts blended with Modern technology is offered by RRR ENVIRO SYSTEMS in their pressure sand filter, activated carbon filter, De-mineralization, softener, iron removal filter, fluoride removal of plants, ozonators, ultra violet sterilizers, ultra filtration, micro filters, nano filtration, electro deionization, reverse osmosis system and so on. RRR ENVIRO SYSTEMS is the largest manufacturer of mineral water processing equipments in the Asian sub-continent. RRR ENVIRO SYSTEMS has a large range of equipments to suite the ever growing package drinking water industry. The mineral water processing plants are specially designed to meet the highest standards of quality and shelf life in accordance with IBWA, ABWA, ECC and BIS guidelines. State of the art Pre-filtration system combined with Reverse osmosis system, sub micron filter, ultra violet and ozonator form an integral Part of the mineral water processing equipments. RRR ENVIRO SYSTEMS offers effluent treatment plants for both the textile and tanning industries. RRR ENVIRO SYSTEMS also offers specialized processing plants to achieve zero discharge. The recovered water from the above plants can be reused. Our teams of trained engineers have installed effluent treatment plants to a number of textile and tanning units throughout the country. Our past experiences in handling different kinds of problems in the above industries help us to arrive at the most efficient and economic solution. RRR ENVIRO SYSTEMS uses the most advanced Nano filtration technology combined with RO and ultra filtration to achieve the best results in water recovery. RRR ENVIRO SYSTEMS has specially designed processing plants to suit the critical needs of the beverages and food industry. RRR ENVIRO SYSTEMS has supplied to all leading manufacturers of soft drinks, juices, beer, package snacks, vegetable oil, rice mill, and other agro based industries. With ever growing urbanization, the demand for quality water is to be met. RRR ENVIRO SYSTEMS has its indigenous built water purification system & sewage treatment plants for housing, apartments and commercial complexes. Water treatment demands, including primary, secondary and tertiary is also built with separate treatments system. We offer economical system for builders, developers and architects. RRR ENVIRO SYSTEMS has clear understanding of the requirements of the power and cogent industries. Power being the backbone of every city, town & industry. It is more important to provide the most efficient solution of process water. Specialized water treatments for boilers and water recovery system from the power plants have been supplied by RRR ENVIRO SYSTEMS over the last decade. RRR ENVIRO SYSTEMS has made intensive studies, which has succeeded in understanding and satisfying the needs of the Chemical, Pharmaceuticals and Electronic industry. Ultra Pure Water with conductivity less than 1.5 micro Siemens free from pathogens following USP 26 27 standards are produced in the specially designed RRR ENVIRO SYSTEMS processing plants. Specialized requirements for the manufacture of semi conductors and integrated circuits are provided by RRR ENVIRO SYSTEMS. With the ever growing demand for process water in the Pharmaceuticals industry, RRR ENVIRO SYSTEMS has incorporated latest technologies like EDI, Ultra Filtration and UV Sterilizations to meet the needs of the industry. RRR ENVIRO SYSTEMS has implemented a large number of Chemical, Pharmaceutical, Hospital and Electronic plants throughout the length and breadth of the country. Seawater Desalination : The world has total of 1.65 billion km3 of water. However, only 0.3 of the total quantity is theoretically usable as fresh water and only 10% of the quantity, that 0.03% is capable of economical utilization. 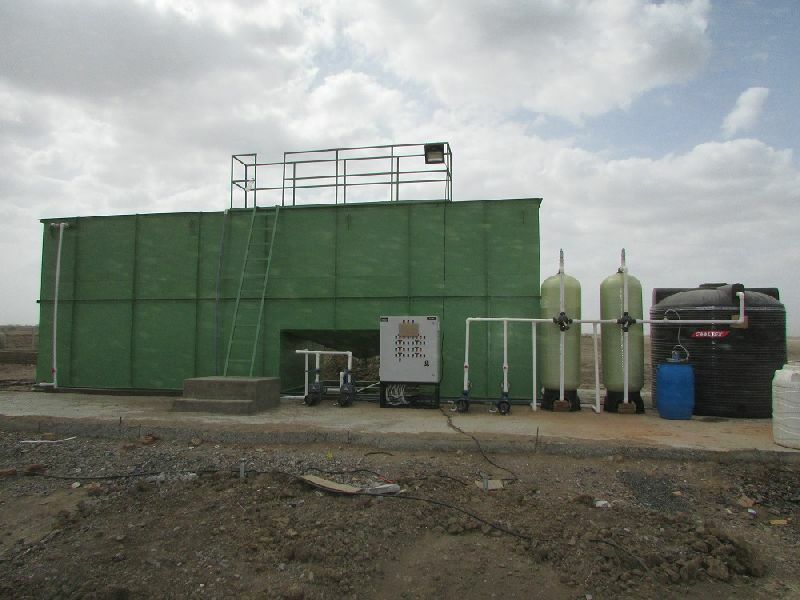 Nipo Systems Pvt Ltd has driven its R&D to build water treatment plants for sea water desalination with its in âï¿½ï¿½house high efficient maximum recovery RO sea water desalination plants worldwide with option of containerized desalination plants as well as on site plants. RRR ENVIRO SYSTEMS specific design team work on the highest engineering standards to ensure trouble free, minimum operating and maintenance cost. Pressure Sand Filters (Total suspended solid Removal) : RRR ENVIRO SYSTEMS filters provide crystal clear water of turbidity level less than 2 to 3 mg/liter on silica scale. Horizontal and vertical filters are available in a complete range of sizes from 0.25 m 3 /hr to 500 m 3 /hr. Normal filtering medium employed is clean sieved grade quartz and fine sand. For applications like iron removal, chlorine reduction special type / filter media are available. The filters are manufactured in SS 316, SS 304, MS FRP as well as FRP Advance Composite. A wide range of chemical dozing equipment is specially designed to meet the specific water quality level. For mineral Water industry special TSS and Absorption Filters are designed to meet the specific water quality level. Iron Removal Filters : This filter has been designed by RRR ENVIRO SYSTEMS with specific purpose of removing high iron content from water. The iron removal filter uses mno 2 and Oxidation System to eliminate the presence of iron in water. Sizes ranging from 250 lph to 5,00,000 lph are in the standard production range. Reverse Osmosis : RRR ENVIRO SYSTEMS specializes in reverse osmosis water purification system. The product range has backing from one of the world leaders in reverse osmosis plant with a proven technical background. The reverse osmosis system offered are ideal for treating of raw water carrying over 1500 mg/ltr total dissolved solids to 35000 mg/litre total dissolved solids. A combination of reverse osmosis/ion exchange dematerializing system is the answer for production of high purity water. De-Gasifiers : The custom designed de-gassers are for removal of carbon-di-oxide from action treated water and desecrators for removal of all dissolved gases at the final stage of boiler feed treatment. RRR ENVIRO SYSTEMS range covers all normal capacities. Micro Filters : The elements manufactured from 100% imported PVDF polypropylene, glass fiber ranging from 30 microns to 0.1 micron. Micron filters are Depth cartridge cartridges, Plated cartridges and Membrane Cartridges. Demineralizers : The system range from two-bed demineralizer to mixed bed polishers capable of producing treated water of purity required for any specific application. Water conductivity is less than 0.1 micro siemen can be achieved. RRR ENVIRO SYSTEMS offers wide range of demineralizers from packaged type units to large custom built installations. Manual, semi automatic plants are available. The units are supplied with chemical handling, resin regeneration system comprising rubber lined steel vessels and tanks and also rubber lined steel piping with cast iron rubber lined diaphragm valves which ensure fail-safe operation as well as Advance Composite FRP Vessels. Activated Carbon Filter : RRR ENVIRO SYSTEMS provides a wide range of Activated Carbon filters to cater to the needs of smell, odour and colour removal. The RRR ENVIRO SYSTEMS Activated Carbon Filters also removes chlorine and unwanted gases. Special Activated Carbon is used for removal of pesticide. Chemical Dozers : Mechanical to work on differential pressure on line and electro mechanical metering pump to dose variety of chemicals. Ozonators : OZONE is the most powerful commercial oxidant in the world. It has been used primarily as disinfectant for drinking water since the early 1900's. Its is also useful for waste water disinfections and malodorous off gases from waste water treatment plants. Because ozone must be generated on site for immediate use, this is best done through an ozone generator. The advantage of ozone for commercially treating waste water is that it destroys bacteria, inhibits algae growth and reduces scaling in problem areas. It has faster reaction rate than chemicals and only oxidation not chlorination, takes places. Base Exchange Softeners : RRR ENVIRO SYSTEMS ranges of softeners are from standard packaged- type-skid mounted and large custom build installation. Units are available manually controlled or semi or fully automatic. RRR ENVIRO SYSTEMS softeners are suitable for treating water for low and medium pressure boilers as well as for process use. The units are perfectly engineered to ensure trouble free and long lasting service with minimum operating and maintenance cost.